So many people are searching for the “secret” to success in their business. They listen to advice from people they admire. For a long time, I was one of those people. I really WANTED to succeed in creating an online business. And I HOPED that the advice that I chose to follow would work for me. I signed up for all the webinars. I joined high priced programs promising fast results. But the truth is, I didn’t really know what I event wanted from my business. I wanted to stop feeling insecure and like a phony. Because I thought money and success would be validation of my worth. But those “fast paths to cash” left me feeling depleted, exhausted, and like a failure and fraud. In fact, it wasn’t until I stopped “trying” to build an online business and made a DECISION that “I get paid to talk to people” that everything started to fall into place. I COMMITTED to building MY business MY way… in alignment with ME and MY TRUTH. Online or offline on longer mattered. Because the real “secret” to success in your business (and mine) is SIMPLE. When you do these first two things, SUCCESS follows. And most people think they’ve done these two key things. When you’ve truly decided to succeed, and committed to the journey, you feel peace in the process, and success becomes inevitable. When you’ve truly decided, you find yourself able to easily discern what tips, tactics, and tools make sense for you. And that alignment comes from having truly DECIDED. Like the feel-it-in-your-bones kind of decision. Declaring that “I get paid to talk to people” was the first business decision I made that felt like that. I didn’t know HOW, but I was committed to earn a living simply by talking to people and sharing my gifts, insights, and wisdom. The details followed my decision and my commitment. 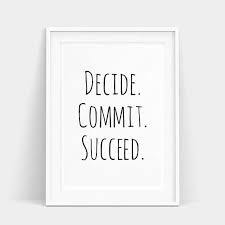 SOOOOOO, I want to encourage you to DECIDE and COMMIT. Whatever it is that you REALLY want from your business, decide that you can have it. And if you are having trouble getting clear on exactly what that is or believing that you can have it, then let’s talk!